"After many years, I have discovered something new about invisible illness. 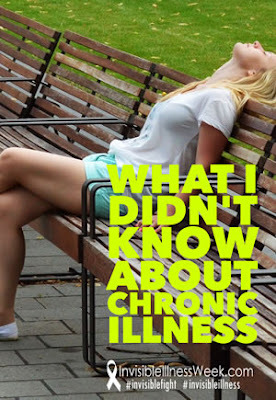 I have lived with an invisible chronic illness for most of my life, but until I became very ill in 2004 there was something I didn’t know about invisible chronic illness. I didn’t know just how hard and physically challenging it could be. I didn’t know how exhausting it was to do what appeared to be easy tasks..."
Please join me today at the Invisible Illness Week website where I am sharing something I didn't know about chronic illness. If you have been reading my blog for a while, you may recognize that this is an old post of mine. I have struggled to come up with new content this summer and fall, but Lisa Copen was so kind to accept an edited and repurposed blog post. P.S. Invisible Illness Awareness Week begins on Monday, September 28th! You can learn more about Invisible Illness Week here.